UNITED NATIONS, August 5 -- Just beyond the Honduran border in Nicaragua, Manuel Zelaya has set up a base and urged his supporters to come across and camp with him, promising them food and shelter. Reportedly, Nicaragua has asked the UN for this help, calling the Zelaya supporters refugees. At the UN in New York, Inner City Press has twice as the Spokesperson for Secretary General Ban Ki-moon if any UN assistance is being provided, but has yet to receive an answer. 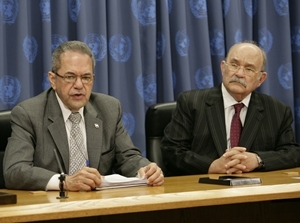 Meanwhile a UN Security Council Permanent Representative, speaking on background because he is a Zelaya supporter, told Inner City Press that he "envies" and is troubled by the compensation paid from the Honduran treasury and taxpayers to the country's pro-Zelaya Permanent Representative to the UN, Jorge Arturo Reina Idiaquez. He put the figure at $16,000 a month, and said that Jorge Arturo Reina Idiaquez is paid, as a sort of bonus, for fourteen months rather than the 12 months in a year. The total, then, would be $224,000. He asked if some of the food and shelter costs at Zelaya's camp should be covered from this, or at other say, by Hugo Chavez. Of Jorge Arturo Reina Idiaquez the Council Ambassador said, "He makes more than me, but his job is not so secure." The Honduran Mission to the UN telling some reporters that Spain has cut off military and other aid to Honduras; the Spanish Mission ot the UN's spokesman is on vacation, and confirmation has been sought but not received. 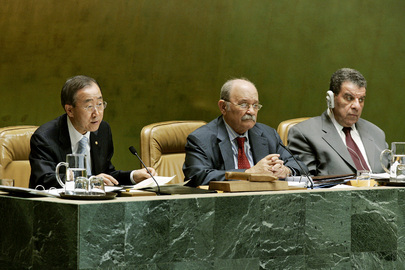 Nor is Spain, usually omnipresent at the UN, listing among the 40 speakers in the August 5 Security Council open debate on peacekeeping, despite its losses with UNFIL in Lebanon. 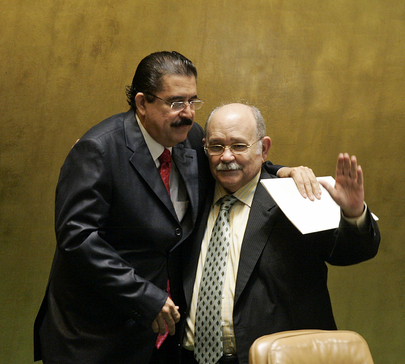 Zelaya supporter Miguel d'Escoto Brockmann, the Sandinista president of the General Assembly, is no longer in New York. He has departed on a trip to Japan. Before leaving, he briefed the Japanese press corps at the UN, telling them that he intends to meet with victims of the atomic bombs in Hiroshima and Nagasaki, and to "ask forgiveness," he said, on behalf of the pilot of the Enola Gay B-29 bomber Paul Tibbets, who he said was a Christian. Most of the Japanese reporters scoffed and wondered what would come out of d'Escoto Brockmann's long distance mission, and who was paying for it. There are moves afoot to reform the office of the President of the General Assembly, to make it more professional and at least more transparent. 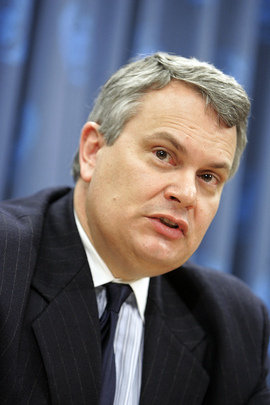 D'Escoto Brockmann's nephew Michael Clark, hired with UN money to advise on the summit on the global financial crisis, recently chided reporters for not covering the Assembly more, and not knowing where his office was. D'Escoto Brockmann's steadfast spokesman denies that the recent resolution to set up an ongoing working group on the crisis will involve any paid positions, for Michael Clark or otherwise. Before Inner City Press wrote about D'Escoto Brockmann's hiring with UN money of his niece Sophia Clark and nephew Michael, comment was sought from Michael Clark, through the spokesman and in person, in the UN cafeteria. None ever came. It is still not yet September. Watch this site. UNITED NATIONS, July 11 -- Against the backdrop of on again off again talks about Honduras hosted in Costa Rica, in New York UN General Assembly President Manuel d'Escoto Brockmann told the Press about his July 5 flight with Manuel Zelaya and said the problem will be solved "soon... probably in less than a week." D'Escoto Brockmann began by saying, "to be frank, I never knew where the plane was from, I was wondering while on it, if it was a plane they rented, maybe it was." But the plane was a Falcon 50 owned by the Venezuelan state oil company, tail number N285CP. D'Escoto said the plane was flown by a "young Venezuelan" pilot. 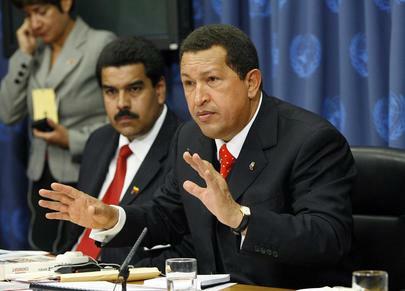 Chavez bragged that it was directed by two Venezuelan Air Force pilots. Chavez was quoted, "About two hours ago, a Venezuelan airplane took off from Washington, with two pilots from the Venezuelan Air Force." Not surprisingly, the new Minister of Foreign Affairs of the Micheletti government -- regime? -- in Honduras Enrique Ortez says he has filed a protest of violation of Honduran air space, so far with Venezuela. Inner City Press: Can you say a little bit more about the plane that Mr. Zelaya and Mr. d’Escoto were on? Whose plane is it, who is paying for the plane, who is paying for President d’Escoto’s return, you know, all this flying around? And I did want to ask you whether the Office of the President of the General Assembly is subject to the jurisdiction of the Board of Auditors and OIOS; if that’s your understanding? Spokesperson Yeves: Okay, on the first question, the plane I think has been widely reported as well in the media. That plane is from the Venezuelan Government, and they put it at the disposal of Mr. Zelaya in case he wanted to use it in his efforts to return to Tegucigalpa. And, it is, as I said, a small plane and the President of Honduras decided who goes in that plane. As for the return from Nicaragua, it will be paid obviously from the President’s budget, I assume if he comes in a regular flight. I am not sure what is the situation now with those planes, as I said, because they have two planes. 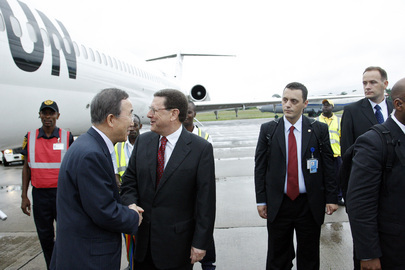 They have also the plane from the Government of Argentina. And as for your second question, yes, of course, everything is audited by the internal and external auditors, like anything else, and the UN. The plane listed San Salvador as it destination, but veered off to Honduras, "from the south," d'Escoto said on July 10. Then, running out of fuel, it went to Managua. Inner City Press asked d'Escoto if the solution might involve early elections. D'Escoto Brockmann responded indignantly, "Only in the mind of someone who doesn't understand democracy. Early elections? Why? There should be early incarceration... of those who perpetrated such a crime" Video here, from Minute 35:40.